There's something you don't know about your daughter. You've suspected this for a long time, whenever she takes a bath, or you go to the pool. She's strangely graceful in the water. Almost too graceful. You've checked for gills or for webbed feet but there's nothing there. Well, if you want the truth... she's a mermaid. Yes, that's right, a mermaid from the ocean depths, transformed by an evil witch so that she might meet a handsome prince. But then she met you and wanted to stay with you and be your daughter, and she's been a human ever since. Your daughter is sure to love the layers of pearly beading and ribbons that are included in this look. The top is printed with a seahorse and seaweed design. The skirt is overlaid with sheer iridescent chiffon that has a silver scale print. 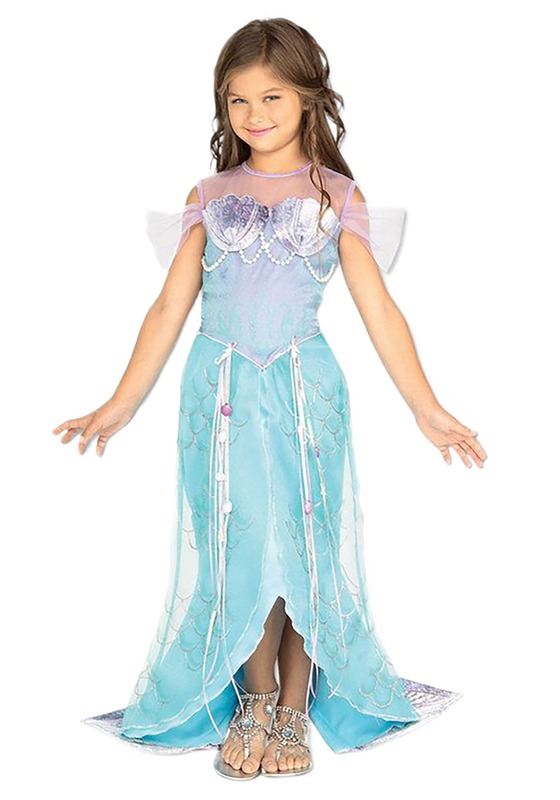 The hem of the dress has adorable fins to make pretending to swim through the ocean currents feel more real than ever! But she can't forget from whence she came (whence is a pretty funny word though). She feels the ocean calling her the same way she feels you calling her when it's time for dinner or time to get out of the bathtub. And you've got to let her be who she truly is. We're sorry to be the ones to break it to you. On the other hand, all things considered, your daughter becoming a mermaid is probably the best surprise you could get. All you really need to do differently is give her an extra couple baths every day, check her scales for parasites, and make fish for dinner every night of the week (do mermaids eat fish? Or are fish like their brothers? Hmmm, okay hold off on the fish for now). Or, if you want things to be much easier, just let her wear this beautiful mermaid costume. She'll be delighted to finally be back to her true form, and you won't need to worry about your water bill going through the roof. It's a win-win!